Very cool shrub that we raised from seed that we received from a friend in New Zealand and it has turned out to be a great garden plant. 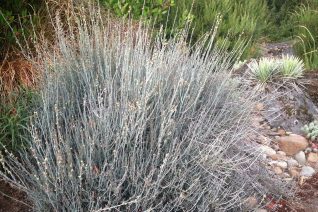 Resembling ephedra or even a rush it bears many many vertical stems that are a soft radiant gray. It spreads slowly underground to expand its range as well as above ground. Not a fast plant. In winter the gray stems take on purple and blue tints. In summer tiny curious white flowers change to tiny star shaped translucent white fruits which spangle the upright stems. Full sun and well drained average soil. Light summer water – but incredibly drought as well as heat tolerant. Mixes well both culturally and aesthetically with things like Cacti and Agave or other dry appearing southern hemisphere shrubs. To 30″ x 30″. Moderate deer resistance.